As the temperatures plummet at – 7 at night, the situation is getting very tough in Paris where many thousands refugees and other migrants are stranded. Several hundreds are sleeping in the streets, and the plan for the extreme cold does not seem to be working for all. No place to go during the day either, for most! They are out in the cold all day. The situation at the official camp is getting chaotic: people who have been in the queue all night hoping to get registered and get in the camp start pushing when they are refused access because the number has been reached (50 new people per day only), and are repressed by police, who are using gas and truncheons. A camp of about 30 people was evicted the 9 /01/2017 – French groups had attempted to set up another camp on rue Pajol. It was quickly and violently torn down by the authorities. Trigger Warning: The beginning of this video is not pleasant. 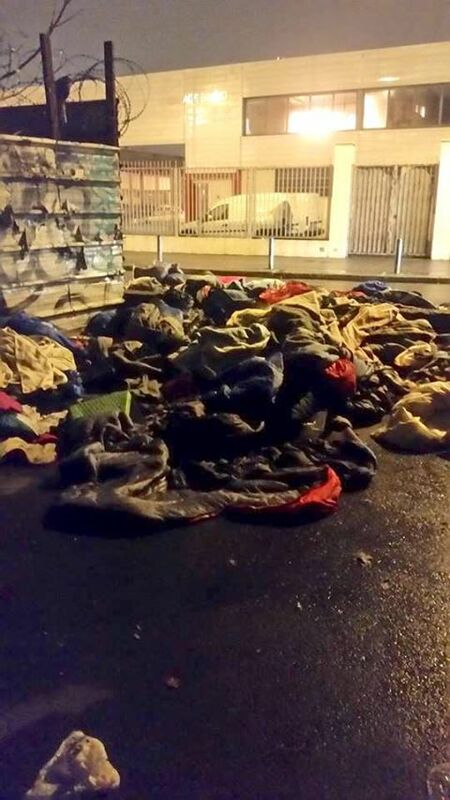 Around 9pm a huge CRS riot police force (at least twelve vans) evicted about 150 people who were sleeping under a bridge near the Porte De La Chapelle centre. They marched people out of the area (it was -4 degrees that night) and prevented them from taking any bedding with them. We were stopped by the police when we tried to recover much-needed blankets. Following this the police followed us to our storage area and towed our van twice within the next thirty hours. So people aren’t allowed to sleep in a tent and they’re not allowed to sleep under a bridge. Where are they supposed to go? – A bit of snow, very cold, temperature goes to -7 , wind, rain, humidity. That is Paris this winter. Nights are very tough. How are the volunteers coping, and what is most needed? -Volunteers are there to keep people alive, that is all we do. We give out blankets, sleeping bags, toiletries, some clothes, shoes, the basic. We pay for the hotels when they get kicked out in the street. Those needs are constant, never-ending, as are the needs of refugees. Until the government changes its policy and starts dealing in more humane and efficient way, we will keep doing this. Volunteers provide much needed support, it has enormous psychological and emotional effect. Just being there for them, just your presence and will to help reflects in many ways. 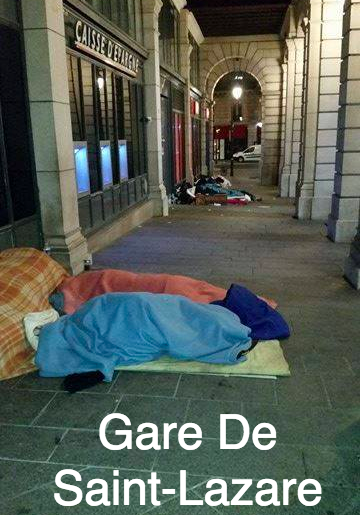 How many migrants in Paris and how many sleeping out? -There are 400 migrants in the official camp and more are sleeping outside it but total numbers are much higher. People sleep in metro stations, all over the city, in hidden places, in squats, and it is difficult to find them all, Paris is a big place. Volunteers are the ones who are opening their doors to the refugees, everyone who has a room to spare is giving it to refugees. I know a woman who is hosting 6 refused minors in her living room, just to keep them out of cold until the lawyers do their work and get them in a project for minors. This type of emergencies is very common, people who have rights to some help, who are recognized refugees, or should be recognized, often find themselves on the streets, sometimes expelled from the centers because of administration’s errors, sometimes because of slow response of the authorities. In every case – not by their own fault. -A lot. Not very visible on the streets, because we – volunteers – are keeping them indoors. We spent thousands of euros last year on hotels just to keep families with small children and the most vulnerable ones away from the streets. a certain document is not given and re-given by organisations and social services. So, the family goes back on street, we place them in hotel for a night – or two if it is a weekend and than – back to CAFDA. Sometimes they are not placed in centers but in cheep hotels that have a kind of a contract with the state – they rent them rooms at very low prices and the government pay for it, so they keep them in business. Families have a priority when it comes to housing. How are the unaccompanied minors are in Paris supported and accommodated? -The painful spot in this all crisis – minors. I have met many, and I have followed the process they have been put trough. There is a section of Red Cross that is called DEMI and they are in charge of the unaccompanied immigrant minors. That means everybody, refugees, “illegal” immigrants, kids with some kind of paper but no parents. They are all under one roof in Paris, at Belville area, until their situation is “sorted”. But there is a catch. If they do not have a document with specified and clear date of birth, that can be used as a proof of their age, they will not be accepted. So we have a bunch of them, without any papers, obviously underage, left outside on the streets. 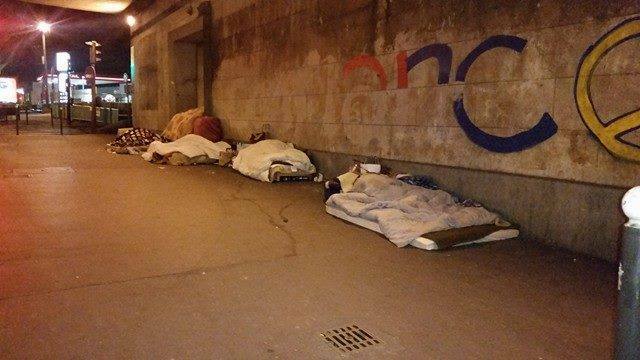 Again many are put hotels thanks to volunteers and associations but there are still minors sleeping in the streets. There are organisations like TIMMY and ADJA who are helping those kids, who are advocating for them, but there are still many who – while waiting for the system to kick in, for lawyers to win the battles for their rights – went missing. I can only hope that they went to other city or other country, but I can’t know what happened to them. Organisations and children services keep whatever information and documents they have on the minors they followed but finding them is very difficult. Questo articolo è stato pubblicato in Senza categoria il 18 gennaio 2017 da EXODUS - watchtheborders. Hi, thank you for sharing lots of our page….. In the future, could you ask permission before posting please.